Le Bateleur, "The Mountebank," the first trump in the Tarot of Marseille. The Tarot (often Tarot cards) are a set of seventy-eight cards, comprising twenty-two Тrump cards, and four suits of fourteen cards each with four Face cards. 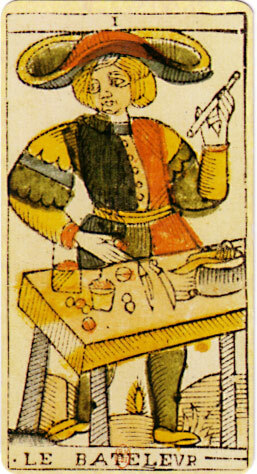 In the English speaking world, Tarot cards are mostly used for divination. Tarot cards are also used in many European countries for playing trick taking card games. Cartomancy is to use Tarot cards for divination. This page was last changed on 16 February 2018, at 16:51.